I don?t remember that we had to key in as many as 8 × 8 = 64 instructions to start with. They were on a short tape. We just keyed in read, skip if flag set, store instruction into memory beginning at 100, next time store one higher, or keep waiting, so go back to start. Something like that. Your right, the basic binary loader (64 instructions) was in a protected area of the memory. If they were accidentally erased we had to unprotect the BBL area (there was a switch) and input them. To do that we input manually a short bootstrap program (if I remember right it was 16 words) that read the paper tape with the BBL either from the teletype (select code 10 octal) or the photoreader (s.c. 11). I remember I wrote a shorter bootstrap. First story: I had to manually key in the paper tape loader so I could read the disk bootstrap from paper tape. When I started the job it was slow and laborious, but after about a month I had it memorized. I'd come in in the morning, open the lab, get a cup of coffee, fire up the 2100, and key in the loader, then load the papertape and let 'er rip. Word got round that I had memorized the loader, and they started a betting pool. After a while all the other labrats would show up to watch me start the machine; if I made an error and had to start over, one side won; if I successfully read the loader on the first try, the other side won. Probably about $20 in $1 bets changed hands avery morninig; my 'hit' ratio was about 4:1 in favor of a successful load, and they actually kept track and gave odds to the betters!!! I have a bunch of HP2117 machines now, but none running (no time). And no paper tape reader (damn!!!). WE had paper tape, and cartridge disk, nothing else... was a 2100MX, I believe. I got 4 HP 2117F machines, fully loaded w/cards, but minimal peripherals; they have a non-HP government floating point board set that replaces the external floating point unit; wish I had that! I used to make HP2100 systems in 1973/1974 and we also entered the loader from memory (I guess you remember 102077). The core stacks would hold the loader, though, and we used to take a loaded core stack and put it into another computer to save us from having to load it every day. Other peripherals included Tape decks, floppy disks, papertape punches and drum storage units. 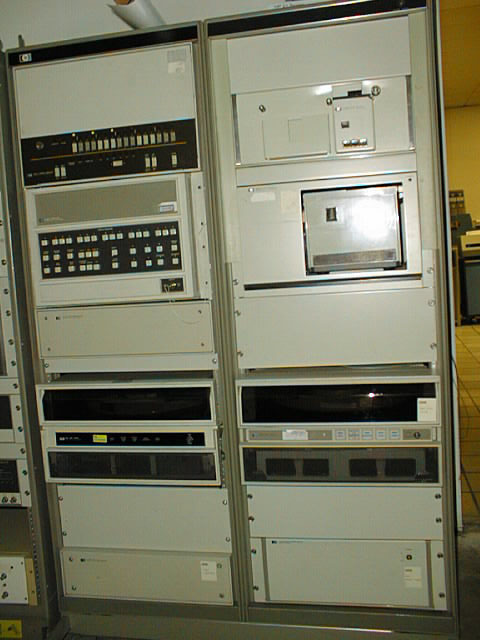 There were a number of operating systems from PTOS (paper tape), MTOS (Magnetic tape), DOS, (Disk), DACE (Data acquisition in Real-time) and a dual-processor Time-sharing system which used BASIC. Other language compilers included Algol, Assembler and Fortran.